“Right now I’m working,” she said, more resigned than annoyed, like it happens all the time, men hitting on her when she’s in mustard yellow ringlets, full clown makeup and shoes the size of Texas. Her words forced our attention to the agile flicks and twists of her hands as she pumped and threaded balloons into a skeleton before our eyes. We were well down the street of the festival before we noticed the skeleton only had one eye so we’ll never know why. Maybe he’s winking, I suggested. The haircut place had its own fun. I was buried in a garish children’s book about mummies and only put it back (sheepishly) once I realized my kid had been called minutes ago and I had no excuse to still be reading. Mummies are fascinating but eavesdropping is safer because you can pretend to be thinking about grown up things. I studied his haircut as surreptitiously as possible once the cape came off and he stood and fairly beamed. The cut suited him, if only because I’d never seen anyone look as happy as I feel when I get a good haircut. He swaggered over to his lady and took a bite of the apple she’d been eating and they traded it back and forth for awhile. Once I saw a small child share an apple with a dog but that was kind of cute. On the way home, we parked by a trail we hadn’t been to in ages and weren’t the only ones to neglect. Already narrow paths were eroding into the creek. I had to warn the kids not to fall in but they were busy jabbing each other with sticks. Several large trees had fallen across the trail at various points. I banged my shin hard climbing across one, not because the walk was cursed but because I was in jeans with a belly full of cheese curd from the festival. We took the high trail by mistake and came out above the mysterious amphitheater and had to go the long way around a meadow of goldenrod and bees. We’ve always wondered about this amphitheater in the middle of the woods. Who dragged the lumber a mile from the trail head or maybe across a raging creek to build it? And why? 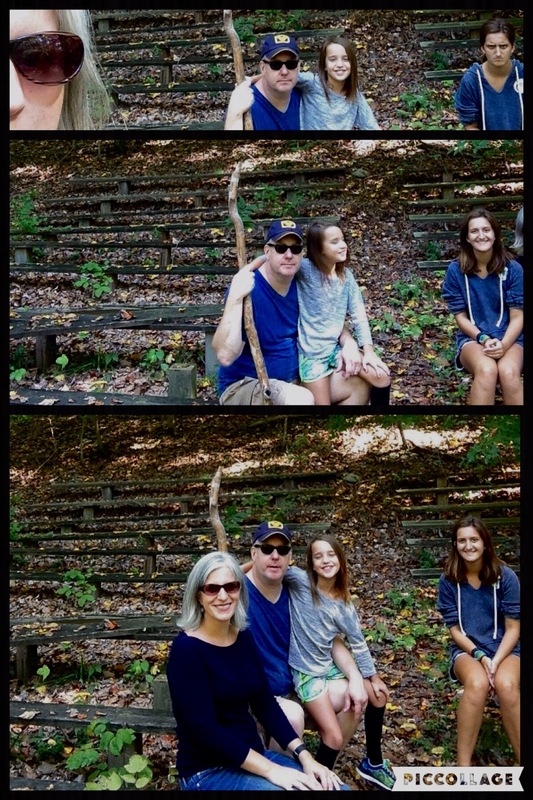 Has it ever been used aside from mock pulpit lectures by power-hungry children on family hikes? Sadly it’s in bad shape, and my shin too, though I managed a series of selfies. The top photo is me not understanding how to work the timer. (My oldest daughter’s expression is my favorite part.) The middle picture is me not understanding mirror images and which side to sit on. Third time’s the charm! I love your daughter’s expression in the first photo. Priceless. Between the clown and the haircut, I have my smile for the day. Thanks Joanne, it’s frameable. She said she wasn’t happy about sitting on the questionable wood benches. We used to cram into one of those photo booths every year but missed the last couple summers. Also, writing this post made me correctly identify goldenrod, which I’d been calling ragweed all these years. That’s fun looking up plant names (I only do that when I’m writing); you learn a lot that way. Ragweed is a serious allergen so all this time I’ve been maligning poor goldenrod. Goldenrod’s a pretty name and plant too.